Microsoft's profit dropped and its revenue was almost flat in its third fiscal quarter, during which the company replaced Steve Ballmer with Satya Nadella as CEO. Revenue came in at US$20.40 billion, down slightly from $20.49 billion in the same quarter last year. Net income was $5.7 billion, or $0.68 per share, down from $6.1 billion, or $0.72 per share. However, Microsoft's revenue matched the forecast of analysts polled by Thomson Reuters and exceeded their earnings-per-share estimate by $0.05. 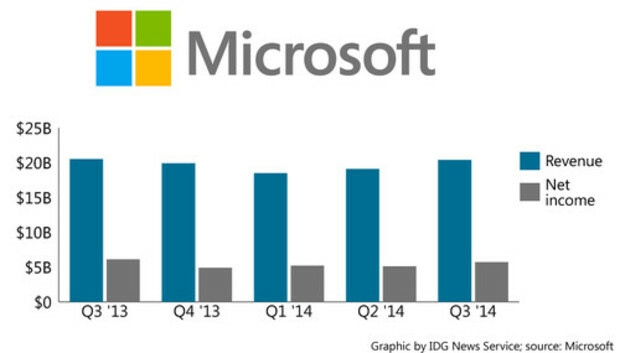 Sales growth for tablets and Windows helped Microsoft's results. On a pro forma basis, which excludes certain one-time items, revenue increased 8 percent and earnings per share rose 5 percent. "I sum up this quarter in two words: execution and transition," Nadella said on a conference call to discuss the results. "We delivered solid financial results and we took several steps to reorient Microsoft." Nadella was appointed CEO in early February, before the quarter was halfway through, and sounded upbeat on his first earnings call since taking over. He said the results reflect Microsoft's strengths and opportunities in a "mobile-first, cloud-first world," a phrase he has used constantly since becoming CEO. Keeping the staff and products focused on that idea is one of his priorities, he said on Thursday. Asked on the call if any significant strategy changes are in the works, Nadella didn't mention any particular area but said his philosophy is to have the company on a continuous cycle of planning and execution, and to revise plans as frequently as needed based on the market. "We've picked up the pace on asking the hard questions," he said. Nadella said he was particularly satisfied with the adoption of Microsoft cloud services, which he considers key for the company's long-term outlook. He cited recent moves to boost the Office and Windows franchises, such as the launch of Office for the iPad, the update to Windows 8.1, the upcoming Windows Phone 8.1 upgrade and the decision to license Windows for free to hardware vendors making smartphones and tablets with screens smaller than 9 inches. The shift from PCs to mobile creates opportunities for Windows and Office, according to Nadella, but requires a different approach to licensing, pricing and technology. "We are committed to ensuring that our cloud services are available across all device platforms that people use. We are delivering a cloud for everyone on every device," he said. The Devices and Consumer division's revenue grew by 12 percent to $8.30 billion, while gross margin fell 1 percent to $4.71 billion. Some highlights were a 4 percent revenue increase in Windows OS sales to hardware vendors, and a 50 percent increase in Surface tablet revenue, to $500 million. Windows sales to hardware vendors weren't uniform. The regular consumer version of Windows saw revenue drop 15 percent, while Windows Pro, which ships with business PCs, posted a 19 percent gain. Microsoft attributed that growth to strong sales in developed markets and in enterprises, and higher penetration in small and midsized businesses. Microsoft also highlighted that Office 365 Home, the subscription-based version of Office for consumers, ended the quarter with 4.4 million subscribers, almost 1 million more than in the previous quarter, and that Bing's search ad revenue went up 38 percent. Despite that spike in search ads, total online ad revenue was up only 16 percent, crimped by a 24 percent drop in display ad sales. Revenue for the traditional Office suite, sold via perpetual licenses, rose 15 percent, thanks primarily to sales in Japan. Combined with Office 365 Home sales, revenue for those consumer-focused versions of Office increased 28 percent. Microsoft cited the April 8 end-of-support deadline for Windows XP for spurring sales of Windows and Office. The Hardware segment of the Devices and Consumer division had revenue growth of 41 percent, reaching $1.97 billion and driven by Xbox and Surface. Microsoft sold 2 million Xboxes during the quarter, and the Xbox business had revenue growth of 45 percent. The Commercial division's revenue rose on a pro forma basis by 7 percent to $12.23 billion, and gross margin rose 6 percent to $9.91 billion. The division's performance was helped by a more-than-100-percent revenue increase from Office 365, the cloud and subscription suite of server and desktop productivity applications for businesses, and by a 150 percent hike in revenue from the Azure cloud platform services. Overall, the Commercial division's cloud revenue more than doubled. Other highlights from the Commercial division include an 11 percent revenue increase in Windows volume licensing for business customers and "double-digit" revenue growth for on premises collaboration and communication server products Lync, SharePoint and Exchange, as well as for the SQL Server database and Windows Server OS. Taken together, on-premises server products had a revenue increase of 10 percent. Revenue from traditionally licensed Office was up 6 percent. Microsoft estimates that about 90 percent of enterprise desktop PCs worldwide now run either Windows 7 or Windows 8. Overall gross margin rose 3 percent during the quarter to $14.5 billion, while operating expense grew 2 percent to $7.5 billion. Microsoft expects to include in its next quarterly report the impact of its $7.2 billion acquisition of Nokia's devices business.